Construction of two St Ayles wooden rowing skiffs being overseen by Members of the Royal Geelong Yacht Club is nearing completion in anticipation of a “soft” launch next month. While those who attended this year’s Wooden Boat Festival of Geelong may have seen the first skiff “christened” as the ‘Bride of Bakhdida’ after the home city of its Iraqi builders and rowed a short distance in and around the marina, a little more work was required to complete this boat as well as a second one. Peter Doyle, one of the organisers of the Wooden Boat Festival who is also a member of Anglesea Recreation and Sports Club, described the circuitous path behind the project to build the St Ayles skiffs. In 1912, for a little more than £8 each, the Anglesea Club had four state-of-the-art wooden rowing “shells” built by Melbourne’s premier boat builder, Jaz Edwards at his Princes’ Bridge sheds. The reception given these rowing “shells” at the 2016 wooden boat festival was the catalyst for Peter’s application to the State government to sponsor a project that would show members of Geelong’s ethnic and migrant communities in a positive, public light. “As one of the oldest sailing clubs in Australia, rowing was always included in equal measure with sailing in all regatta events. 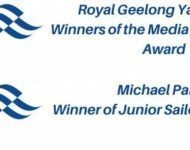 The Royal Geelong Yacht Club was looking to expand its engagement with the Geelong community and diversify its on-water activities so was happy to get behind the grant application and the project,” Mr Doyle said. Those involved in the project are from the Geelong’s migrant, refugee and asylum-seeker communities who came together under the auspices of Diversitat, the not for profit charitable community service organisation. The project also embraces the Geelong Lifeboat Group which provides support, training and social inclusion for people who have suffered abuse by members of the clergy. Guided and mentored by members of the Royal Geelong Yacht Club, men and women from Iraq built the first St Ayles skiff. The second skiff was built for the Lifeboat Group. While construction of the first two skiffs began in waterfront premises provided by Deakin University, the project is now headquartered in the precinct of the historic Barwon Paper Mill at Fyansford. Many visitors to the site are surprised when they find out that such an elegant 6 metre long skiff, rowed by four people with a coxswain, is an inexpensive kit boat. Its story began in 2009 when the Scottish Fisheries Museum, concerned that the Scots were losing their connection with the sea, sought a way to remake that age-old relationship through coastal rowing on the Fife coast. The Museum accepted a design from an Australian born boat designer who teamed with a former IT professional to deliver a boat that has become a phenomenon with communities across the globe. “To say nothing of the wealth in diverse culture that they bring to our lives, the project’s objective is to have the Geelong and Bellarine region recognise that our ethnic, refugee and asylum-seeker people are multi-talented assets that are under-valued and under-utilised yet core to the future of our community and economy,” Mr Doyle says.